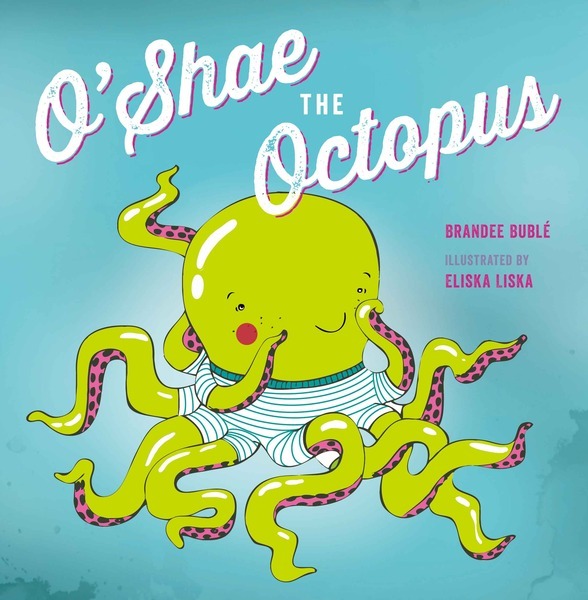 Quill and Quire: "O’Shae is a young octopus who was born with 10 arms. His mother thinks O’Shae’s two extra limbs make him special, and he has no reason to think otherwise, especially since his bonus appendages are very useful when helping around the house. However, when O’Shae goes to the park with his friend Shelton the Shark, he is bullied because of his differences. With his friend’s support, O’Shae comes up with a plan to prove how useful two extra arms can be. Debut author Brandee Buble’s background as a special-needs teacher shines through in this uplifting story about individuality and acceptance. In addition to showcasing a deep understanding and respect for children’s differences, Buble is a talented wordsmith. She deals with bullying a gentle way, with the bullies apologizing at the end of the story. In less able hands, this resolution could have been too precious, but it works here. Though the message is obvious, children are unlikely to mind thanks to the bouncy, rhyming text that begs to be read aloud. Buble’s tale works well on its own, but is enriched by Eliska Liska’s vintage-style illustrations. The bold color palette features pea-green undersea foliage, rich teal water, a lime-green O’Shae with magenta accents and a few splashes of grey. Each scene is enhanced by fun details. When O’Shae helps his parents around the house, he holds a different cleaning tool in each of his ten hands; the park O’Shae and Shelton visit features a clam-shell swing and seaweed climbing tower; one of the bullies—a lobster—has spiked bracelets and a slingshot. Parents, educators and librarians would do well to consider O’Shae the Octopus when seeking sources to teach children about bullying. The book holds great educational value, whether shared one-on-one, in story time, or in the classroom. Happily, as this is the first in the One of a Kind series of picture books, we can expect more excellent material from Buble in the future." Mallory Heart Reviews - "A really cute and enterprising children's book (but adults can use the reminder too!) about capitalizing on our differences and uniqueness, and how these can be strengths to turn the tide of bullying. O'Shae and pal Shelton are adorable." 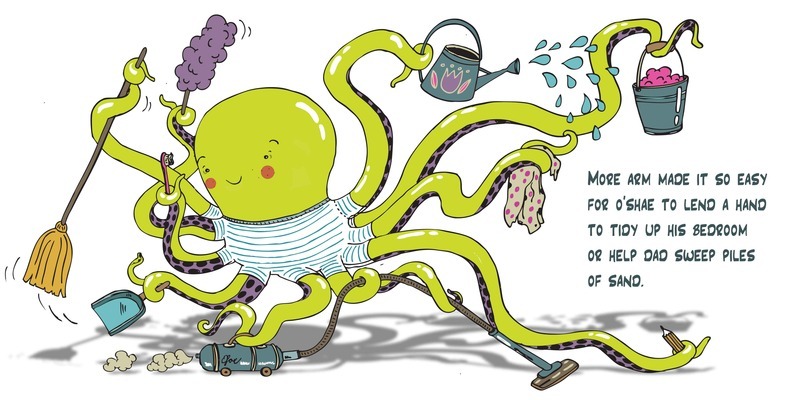 San Francisco Book Review: "O’Shae the Octopus is about a little octopus who is very tidy. His mom says he is so lucky to have ten arms and it is true; it lets him help and do a bunch of things at once. He can clean his room, vacuum, help his dad, and water the garden. 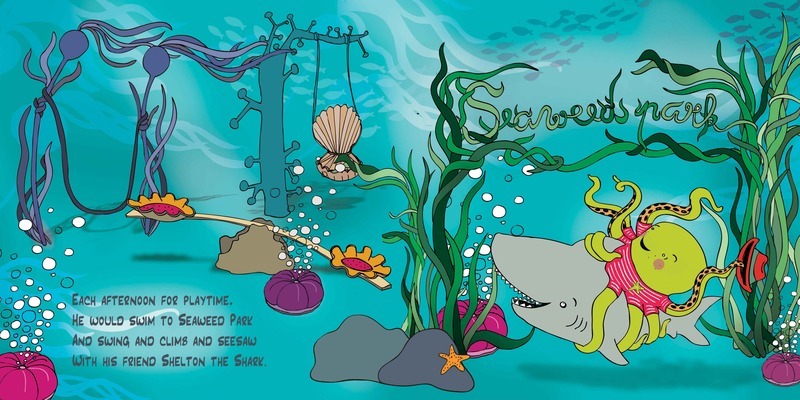 At playtime, he goes to Seaweed Park with his friend Shelton the Shark. They swing and seesaw and have lots of fun. Two bullies show up and tell Shelton his friend is weird and they have to leave. Shelton hears and is so sad. His good friend Shelton tells him his ten arms are great because he can do so much more than he could with eight. O’Shae gets happy and starts swirling Shelton around like a merry-go-round. He realizes he can be a park himself. All the creatures line up to go on the best playground. The bullies say sorry and tell him he is sensational. Then four happy friends play in the ocean. I like that O’Shae made a great playground for all the other fish. 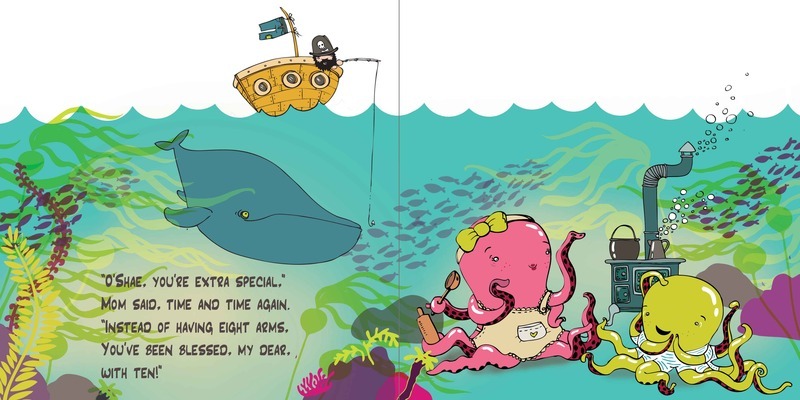 I really like the pictures in the book, especially the one with all the little creatures playing on O’Shae the Octopus." 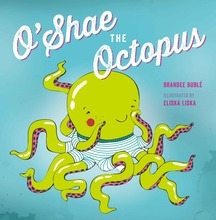 O’Shae is an octopus who has ten legs instead of eight. He gets pushed off the playground by aquatic bullies who make fun of O’Shae because he’s not like he’s supposed to be. Many books try to deal with the problem of bullies but this one gets it right. The message isn’t heavy-handed, not even when O’Shae inevitably discovers how his extra arms make him extra special. Testament to this is that Phoenix usually doesn’t buy it when the hero becomes friends with the bullies – with this book he did.